NACCHO @AMSANTaus @CAACongress respond #NTRC #DonDale Royal Commission demands sweeping change – But how can we make it happen? ‘ This Commission has been a landmark opportunity to expose the brutal and inhumane treatment of children in youth detention centres in the Northern Territory. Children have been stripped, assaulted and have been left languishing in cells in isolation for extended periods of time. This is no way to treat children. We need to do things vastly differently so that these abuses do not happen again. APO NT is encouraged to see the Commission has emphasised the importance of youth diversion, prevention and early intervention initiatives, and the need for a single Act covering youth justice and child protection. “You don’t set up a royal commission and then walk away from the implementation of it. I urge the Federal and NT Government to give resources directly to Aboriginal community controlled groups, as white non-government organisations “need to get out of that space”. Those days are over. 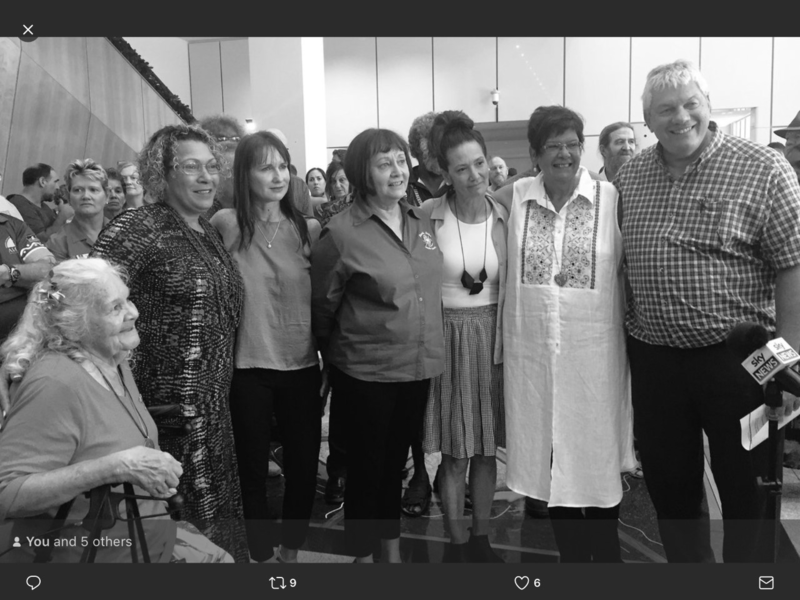 National Aboriginal Community Controlled Health Organisations chief executive Pat Turner calling on Prime Minister Malcolm Turnbull to “put his money with his mouth is. 1. Close Don Dale Youth Centre (and report progress on this by February 2018) and replace with a new, purpose-built facility. 2. Immediately close the high security unit at Don Dale. 3. Raise the age of criminal responsibility from 10 to 12 . 4. No child under 14 to be ordered to serve detention unless they have been convicted of a serious and violent crime, present a serious risk to the community and their sentence is approved by the head of the proposed new children’s court. 5. Set up a new Children’s Court. 6. Set up a specialist youth division within the police force and make sure all police cells are suitable for detaining children. 7. Establish a Commission for Children and Young People, with jurisdiction for all children and young people in the NT. 8. Stop the use of tear gas and continue to ban spit hoods and the restraint chair. 9. Set up at least 20 family support centres to help children and their families. 10. Develop a 10 year strategy for generational change around child protection and the prevention of harm to children. This would be led by the NT chief minister with specific targets and measures. The Aboriginal Peak Organisations Northern Territory (APO NT) welcomes the Royal Commission’s final report, handed down in Darwin today. Over the past 14 months, the Royal Commission has examined the failings of the youth justice and child protection systems in the Northern Territory and heard ideas for change including from Aboriginal young people and families directly impacted by these systems. ‘This Commission has been a landmark opportunity to expose the brutal and inhumane treatment of children in youth detention centres in the Northern Territory. Children have been stripped, assaulted and have been left languishing in cells in isolation for extended periods of time. This is no way to treat children. We need to do things vastly differently so that these abuses do not happen again’, said John Paterson CEO AMSANT. The Commission has made unequivocal findings that the Northern Territory’s youth justice and care and protection systems continue to fail young people and that wholesale reform is required. ‘APO NT is encouraged to see the Commission has emphasised the importance of youth diversion, prevention and early intervention initiatives, and the need for a single Act covering youth justice and child protection’, said Mr Paterson . The report recognises the critical involvement of Aboriginal organisations and communities in reforming all aspects of the system to bring about real change for Aboriginal people across the Territory. As a first step, Government must immediately establish a process with Aboriginal organisations and community leaders to ensure Aboriginal people are actively involved in the change that lies ahead. The Royal Commission represents a significant step in addressing the crisis facing our child protection and youth justice systems. ‘The work doesn’t stop here. We’ve got to keep the spotlight on these issues so the abuses our kids have faced in detention and in the child protection system don’t happen again. Now is the time for the Commonwealth and Northern Territory Governments to accept all the Commission’s recommendations and commit to adequate resourcing of and independent oversight and monitoring of all recommendations of the Royal Commission’, Mr Paterson said. APO NT pays tribute to the courageous Aboriginal young people and families who came forward to tell their story to the Commission. It is through their crucial involvement that the Commission has been able to expose the systemic failings and abuses and provide a roadmap for a better future for all children in the Territory. The Northern Territory has the opportunity to lead the way in reforming care and protection and youth justice in Australia. We must build on the momentum for change and work together towards a future where all children have the opportunity to thrive as part of strong and loving families and communities. Today, Congress welcomes the release of the final report from Royal Commission into the Protection and Detention of Children in the Northern Territory. “We commend the findings and recommendations of the Royal Commission, particularly where it is apparent that the experiences of those young people and their families were taken into account along with the submissions from key Aboriginal community controlled organisations and expert evidence from all over the world about what really works” Central Australian Aboriginal Congress Chief Executive Officer, Donna Ah Chee said. “We also know that the ‘get tough’ rhetoric in relation to youth offending does not work and that a preventative and therapeutic approach is what is required. This point was articulated by Commissioner White today drawing on evidence from all over the world. Commissioner White also made clear that a paradigm shift to a treatment and rehabilitation approach rather than a “lock them up” punitive approach could save the NT more than $300 million per year in ten years. Congress welcomes Commissioner Gooda’s impassioned plea for change, acknowledging that throughout the Territory he heard that Aboriginal parents everywhere are ready for change and there is an acceptance that there is a need to do better. Congress was pleased to see the major recommendations in our submission accepted including the need to increase the minimum age for criminality from 10 to 12, and the need to establish small scale secure care rehabilitation facilities for young people in need whilst also ensuring our young people are diverted away from the criminal justice system. “The journey to this point has been a long one for those affected, beginning not just with the events that precipitated the Royal Commission. This report is the product of every similar enquiry, and every action – and inaction ­– that has taken place before this in our history. “Recently, the NT Government has shown their commitment to tackling many of the issues that affect young people today including early childhood and alcohol. “Congress looks forward to working with the Northern Territory and Commonwealth governments and other leading Aboriginal organisations, including AMSANT and APONT to ensure that the recommendations detailed in this report do not just sit on the shelf, but are implemented in a timely manner with Aboriginal communities and organisations at the forefront of decision making and delivery. The National Aboriginal Community Controlled Health Organisation (NACCHO) calls on the Northern Territory and Australian Governments to work with Aboriginal Community Controlled Organisations on the implementation of recommendations of the Royal Commission and Board of Inquiry into the Protection and Detention of Children in the Northern Territory released today. It is clear from the report that the current system of detention in the Northern Territory is failing our children and young people, leaving many more damaged than when they entered. The system of detention is punitive, harsh, and not in keeping with modern rehabilitative standards. We also know that the child protection system in the Northern Territory is letting down children and their families and is inextricably linked to youth justice issues. Aboriginal children and young people living in the Northern Territory are overwhelmingly impacted with ninety four per cent of children and young people in detention being Aboriginal. “The extent of this over-representation of Aboriginal children and young people compared with all other children and young people compels a special Aboriginal led response.” said NACCHO Chief Executive Officer Ms Pat Turner. NACCHO acknowledges the young people and their families who shared their stories of trauma and survival and the Aboriginal Community Controlled Organisations that supported them. “I particularly want to acknowledge the work of Danilla Dilba, led by Ms Olga Haven, in providing evidence based submissions to the Northern Territory Government and the Royal Commission to inform their considerations,” said Ms Turner. It is now time for the Northern Territory Government to take full responsibility and lead a change by working with Aboriginal Community Controlled Organisations on the implementation of the Royal Commission recommendations. “I think to be honest these recommendations should be not only for the Northern Territory, but for all states across Australia.” – Former Don Dale detainee Dylan Voller. “We really welcome this report because it’s really taken into account the things we have been lobbying for many, many years now and it’s always fallen on deaf ears.” – North Australian Aboriginal Justice Agency CEO Priscilla Atkins. “This royal commission very much began there and it needs to end there.” – NT Chief Minister Michael Gunner. “Early intervention, diversion and rehabilitation must be front and centre of Australia’s justice system to protect the lives of our children.” – National Congress of Australia’s First Peoples. “The children who suffered in Don Dale and all Australian children need a guarantee that our governments will do everything they possibly can to stop this happening again.” – Human Rights Law Centre lawyer Shaleena Musk. “This is clearly a backwards approach – there must be more funding for the beginning of the cycle, with an emphasis on early intervention, prevention, rehabilitation and community-led diversion programs.” – Law Council of Australia president Fiona McLeod. “The Northern Territory and federal government must listen and work with local communities and Aboriginal and Torres Strait Islander organisations to take these important findings and recommendations by the Royal Commission forward.” – Amnesty International’s Roxanne Moore. “We need to heed the recommendations of the Royal Commission, not only to prevent another Don Dale-type scandal but to stop more crimes from being committed, because we all deserve to be safe.” – Red Cross executive director Andy Kenyon. “We will take the time to scrutinise this report in detail.” – Ben Slade from Maurice Blackburn lawyers. “Jailing children does not work – it harms them and the community.” – Kathryn Kernohan from Jesuit Social Services.